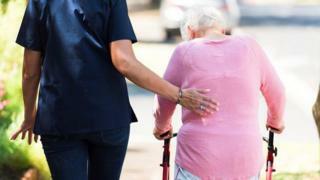 Almost half of providers of social care services - including care homes and support in the community - face difficulty recruiting the right staff, a report has said. The Care Inspectorate said more than a third of providers (35%) across the sector reported vacancies in 2016. Its report is the first overview of staffing shortages in social care. Officials said Brexit could pose further challenges, with many European workers currently in the sector. The report also found 41% of care providers reported problems in in recruiting suitable staff. Karen Reid, Care Inspectorate chief executive, said more than 80% of care services in Scotland were judged to be good, very good or excellent in respect of the quality of care they provide. This was due, she said, to the dedication, professionalism and commitment of the social care workforce. But Ms Reid added: "Our evidence shows that people benefit from an effective and stable staff team which allows people experiencing care to build trusting relationships with the people supporting them. "Recruitment and retention remain major challenges in some parts of social care. The reasons are complex and not easy to resolve. "Our report shows where recruitment is most challenging and spells out some of the difficulties Scotland's almost 2,600 social care employers describe." She said with people living longer, and early learning and childcare being expanded, Scotland needed more people to work in social care. But the skills, experiences, and values of social care staff were just as critical as the number employed. The report compiled figures from each care service in Scotland, across early learning and childcare, children's services, and adult social care. Because it covered the period on either side of the Brexit referendum, officials said it was not possible to say whether the vote would have an effect on care services. But they said there were significant numbers of European workers in the care sector, so they would be keeping a close eye on the situation. The inspectorate said it had published the report to support care services in their recruitment plans and integration authorities in their strategic commissioning plans. Among its findings were that problems filling vacancies were reported by care at home services (64%), care homes for older people (57%), care homes for adults (49%) and housing support services (48%). Additionally, nurse agencies (61%) and residential special schools (61%) had a high proportion of services reporting problems filling vacancies, although these percentages were based on a small number of services. Too few applicants with experience (58%), too few applicants in general (58%) and too few qualified applicants (50%) were the most common reported themes within most service types for why vacancies were hard to fill. Aberdeen (57%), Perth and Kinross (52%) and Fife (51% of services) had the highest proportion of services reporting that vacancies were hard to fill.